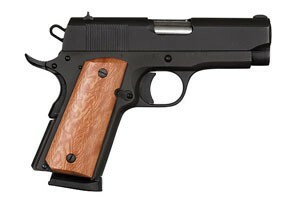 Chambered in .45acp and outfitted with a shooter barrel, smooth wood grips, and a parkerized finish, this is the 1911 Compact GI. Faithful to the original 1911 design, the Standard GI is equipped with a 5 inch barrel, fixed sights, and a 7 round magazine. Perfect for the first time shooter, collector, or lawful concealed carry.